I think I live in Queensland's rain capital. Northern Queensland would like to say that it has the state's greatest rainfall, but I believe where I live on the Sunshine Coast trumps what falls out of the sky up North. It is Saturday and I had so many plans for the weekend. It is early Autumn and I have been re-acquainting myself with my garden again, after a summer of neglect, making myself busy moving around the garden furniture, mulching my fruit trees and adding a few pops of colour with some potted flowers. For the afternoons after work where I have had the opportunity to be outside, I have been enjoying pottering about and loving my space again. Well it has been raining for weeks, with a day of respite here and there, well enough to get the sheets almost dry or make you wish you hadn't washed at all. Good weather for baking! Which is exactly what I did today. I baked and I watched the rain fall outside and it was lovely. As much as I enjoyed myself, it is now evening and the rain is still heavily falling, tomorrow is Sunday and I think I may develop morbid obesity if this weather keeps up, plus a scorching case of cabin fever. Preheat oven to 180C. Line two baking trays with baking paper. Place chocolate, butter and sugar into a saucepan over low heat, stirring regularly until chocolate and butter have melted. Remove the pan from heat and add vanilla and eggs. Stir to combine, making sure the eggs are well mixed into the chocolate mixture to ensure they do not scramble. Sift in cocoa, flour and salt and mix well to combine. Place dough in the fridge for about 10 mins, this will firm it up a little and make it easier to work with. In a separate bowl, place cream cheese and icing sugar and mix with a hand held mixer or by hand until smooth. Remove dough from fridge and roll tblsps of dough into balls. Place on lined trays, ensuring you leave space for spreading (I put about 8 per tray but this will depend on the size of your tray). Make an indent in each cookie with your thumb and fill centre with a dollop (about a teaspoon) of the cream cheese mixture. 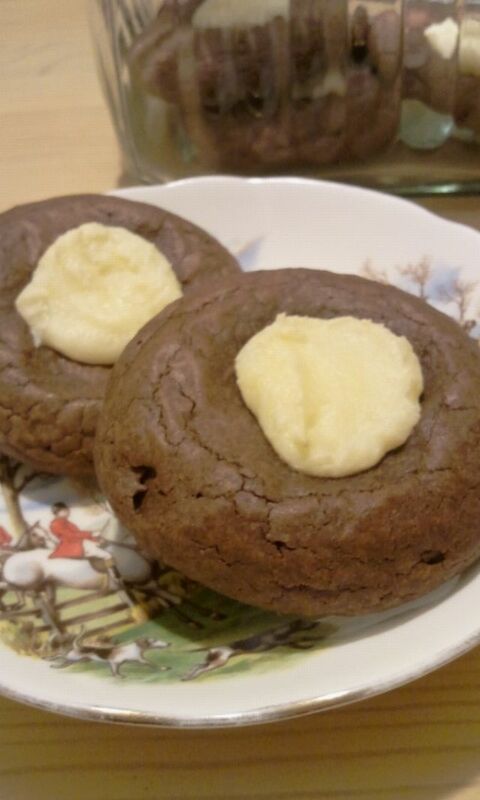 Bake for 30 minutes, or until you notice the cookies are cracked on the outside but soft in the centre. Swap trays after 15 minutes. Remove from oven and cool on a wire rack. The cookies should keep for about 5 days in an airtight container if they don't get eaten beforehand! Makes approximately 24.